There are many reasons why you might want to find the security identifier (SID) for a particular user's account in Windows, but in our corner of the world, the common reason for doing so is to determine which key under HKEY_USERS in the Windows Registry to look for user-specific registry data. See How to Find a User's SID in the Registry further down the page for instructions on matching a username to an SID via information in the Windows Registry, an alternative method to using WMIC. The wmic command didn't exist before Windows XP, so you'll have to use the registry method in those older versions of Windows. In Windows 10 and Windows 8, if you're using a keyboard and mouse, the fastest way is through the Power User Menu, accessible with the WIN+X shortcut. If you don't see Command Prompt in the Power User Menu, type cmd into the search bar in the Start menu, and click Command Prompt when you see it. You don't have to open an elevated Command Prompt for this to work. 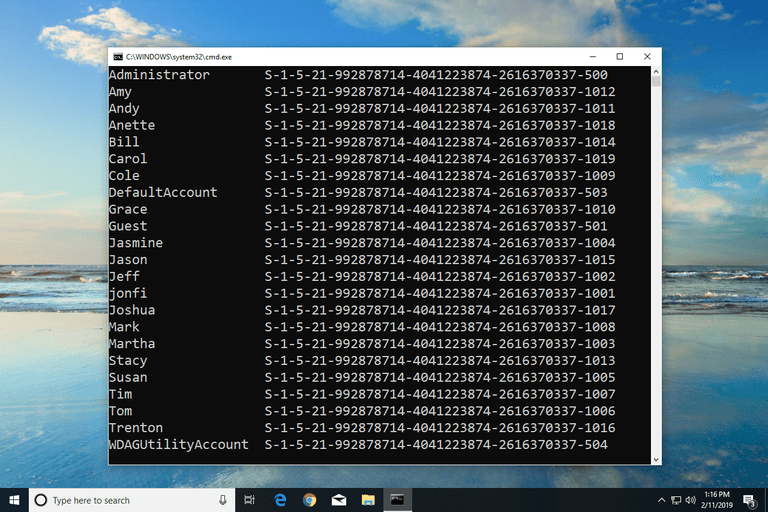 Some Windows commands require it, but in the WMIC command example below, you can open a regular, non-administrative Command Prompt. If you get an error that the wmic command isn't recognized, change the working directory to be C:\Windows\System32\wbem\ and try again. You can do that with the cd (change directory) command. You should see a table displayed in Command Prompt. This is a list of each user account in Windows, listed by username, followed by the account's corresponding SID. Now that you're confident that a particular user name corresponds to a particular SID, you can make whatever changes you need to in the registry or do whatever else you needed this information for. For example, the ProfileImagePath value under the S-1-5-21-992878714-4041223874-2616370337-1001 key on my computer is C:\Users\jonfi, so I know that the SID for the user "jonfi" is "S-1-5-21-992878714-4041223874-2616370337-1001". This method of matching users to SIDs will only show those users who are logged in or have logged in and switched users. To continue to use the registry method for determining other user's SIDs, you'll need to log in as each user on the system and repeat these steps. This is a big drawback; assuming you're able, you're much better off using the wmic command method above.